Protesters in Arunachal Pradesh have burnt down the bungalow of Chowna Mein as anger and unrest continues against the state government in Itanagar. Tension continues to simmer in Arunachal Pradesh's Itanagar. The situation in Arunachal Pradesh has taken a turn for the worse with the state government suddenly climbing down in the face of violent protests and declaring that it will not implement the report granting Permanent Residency Certificates to six communities living along the Assam-Arunachal border. Protesters in Arunachal Pradesh have burnt down the bungalow of Deputy Chief Minister Chowna Mein as anger and unrest continues against the state government in Itanagar. Chowna Mein was moved out from state capital Itanagar and shifted to Namsai district early Sunday morning. Security forces resorted to blank firing as the the unruly protesters defied curfew and marched towards Chief Minister Pema Khandu's residence.The protesters also torched and vandalised two police stations in Itanagar and adjoining Naharlagun, while a police superintendent officer was reportedly injured. Authorities on Saturday imposed an indefinite curfew in Itanagar and Naharlagun as demonstrators protesting against the government's move to grant PRCs to non-Arunachal Pradesh Scheduled Tribe communities went on a rampage, indulging in arson and stone pelting. After three days of protests, vandalism, arson and the loss of a life, the BJP-led government of Arunachal Pradesh today scrapped the plan to give permanent resident status to six tribes and Gorkhas who don't belong to the state. 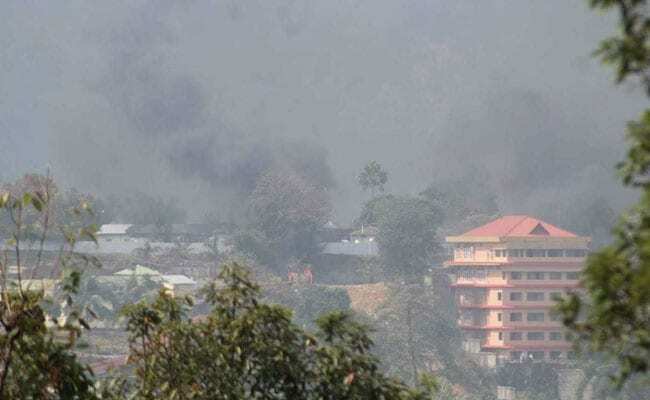 The announcement came after daylong protests during which Deputy Chief Minister Chowna Mein's private house was torched and the police fought a pitched battle with a mob bent on targeting Chief Minister Pema Khandu's house in Itanagar. Union minister Kiren Rijiju accused the Congress of instigating the people of Arunachal Pradesh to protest against the move to grant permanent resident certificates to six communities living in the state. Mr Rijiju also said Arunachal Pradesh Chief Minister Pema Khandu has clarified that the state government was not bringing the bill on PRC but only tabling report of the Nabam Rebia-led Joint Hight Powered Committee comprising members and student organisations. Congress Twitter handle tweeted saying,"We condemn the violence that occured in Itanagar and urge the people of Arunachal to maintain peace." We condemn the violence that occured in Itanagar and urge the people of Arunachal to maintain peace in the state. It is pertinent to stand united at this juncture and resort to only lawful means to secure justice. Curfew is in place at Itanagar and adjoining areas and the army has also been deployed. Six companies of the Indo-Tibetan Border Police were also brought in to restore law and order. The protesters also torched and vandalised two police stations in Itanagar and adjoining Naharlagun, while a Police Superintendent officer was reportedly injured. Security forces resorted to blank firing as the the unruly protesters defied curfew and marched towards Chief Minister Pema Khandu's residence. "The situation is very tense and uncontrollable. The state is taking all steps to calm the situation," Home Minister Kumar Waii told IANS. Police station and a fire station vandalised after violence broke out during a strike called by 18 student and civil society organisation against state's decision to grant permanent resident certificates to non-Arunachal Pradesh Scheduled Tribes of Namsai and Changlang. Tension continues to simmer in Arunachal Pradesh's Itanagar and its adjoining areas in the wake of a man's death in clashes that broke out between police and agitating members of the tribal community on Friday.